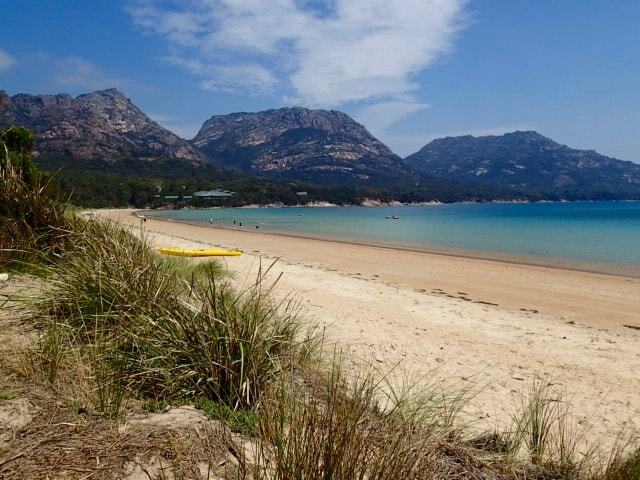 No trip to the East Coast of Tasmania seems complete without a trip to the Freycinet National Park. It is famous for its rugged mountains, and it's beautiful beaches, with the most popular one being Wineglass Bay (probably also the most photographed beach in Tasmania too). It would have to also be one of Tasmania's most popular locations to unwind and go camping. It's easy to see why once you visit. You just need to plan ahead if visiting this part of Tasmania at Christmas. More on that later. Freycinet is about 3 hours from Hobart, and getting there is easy as its well sign posted all the way. Head out of Hobart, towards Sorrell, on the A3 highway and then head towards Coles Bay (C302 road). It's a pretty drive and the Park is very close to the small town of Coles Bay. Before you rush out and grab a spot at Freycinet National Park, there are a couple of key things you need to know. 1. It's so popular at peak times, a ballot system is in place for campsites. Peak times are Easter and Christmas. 2. There are other locations nearby, including a Big 4 Caravan Park, but that fills very quickly too, so don't rely on that being available as a back up. If you want to camp in peak periods, you will want to read up on this Freycinet Camping Information PDF supplied by the Parks & Wildlife Service of Tasmania. It provides key dates on when and how you enter the ballot. You may be lucky enough to secure all of your dates you request or just a couple of days. One couple we met, had requested 10 days on the ballot and only got 2 nights, so that gives you an indication of what you might expect. If you are lucky enough to secure a spot in peak time (or go outside peak time) what can you expect? There are powered and unpowered sites, and we didn't investigate the powered section at all (but I do know that the powered sites do have drinkable water, amenities block and grey water disposal). 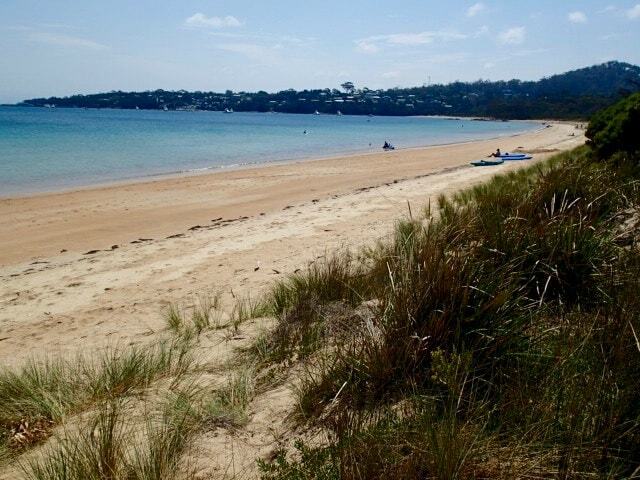 As for the unpowered sites, they are divided into different areas - the Sand Dune sites and Honeymoon Bay. We are familiar only with the former (it was so crowded when we were there, we didn't get down to Honeymoon Bay). You will be allocated a site number, and from the road that winds past the campsites, the only thing visible from the road is vegetation and the toilet blocks - which means campsites are not visible from the main road that winds through the park. Access road to the campsites is narrow and takes you very close to the individual sites, which are shady and private. The sites are well separated. You are not on top of another campsite which makes your site feel secluded. There is access to the beach from most sites (or you share a track with another site to reach Richardsons Beach). The campsites have barriers which means you need to camp within the space provided and not past any barrier. The sites are 6m x 7m, so you can fit a good sized family tent in there with room for tables/chairs. There will only be 1 spot to park your car, so anymore cars belonging to your group, will need to find a spot in the overflow car park, and you will need to walk back to the site! There is a designated backpacker section - no bookings taken for this, but you do need to check in with Ranger station to get a spot for this area. If you have a car, this is not the camping section for you. Your proximity to the toilet block will depend on your site. 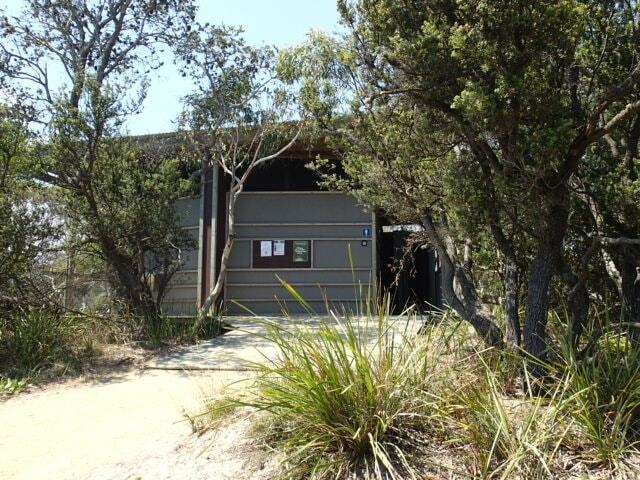 There are 3 toilet blocks for the unpowered campsites in the Sand Dunes section. Apparently if you are in Honeymoon Bay, the walk to a toilet block is a bit longer but as we didn't stay there we can't tell you how long it is! Cold showers are available at some of the sites. If you need water, there are some taps along the access road that runs by the campsites but you do need to treat prior to drinking. Despite this being Tasmania, water is scarce so you do need to use water responsibly. No campfires at all allowed in this Park, and its fuel stove only (but on Total Fire Ban days, not even those are allowed, and you will need to head to the Ranger station where there are electric BBQs for your use). The Visitor Centre at the beginning of the Park has lots of information about the area, can advise on walks and if you need other accommodation options, they can direct you to Friendly Beaches which is free camping, not too far from the Park (but also is busy in peak times). The town centre of Coles Bay is very close to the Park, so if you have forgotten anything, you can easily go into town for supplies or a meal. Whilst not a big town, it will have everything you need for your camping trip (likes ice, food, alcohol). This is the sort of place where you can do as much as you want, or do as a little as you want. Your campsite is so close to the beach, you can spend plenty of time on the beach or swimming if the weather is warm. Cooler days you can just walk along it and admire the scenery. 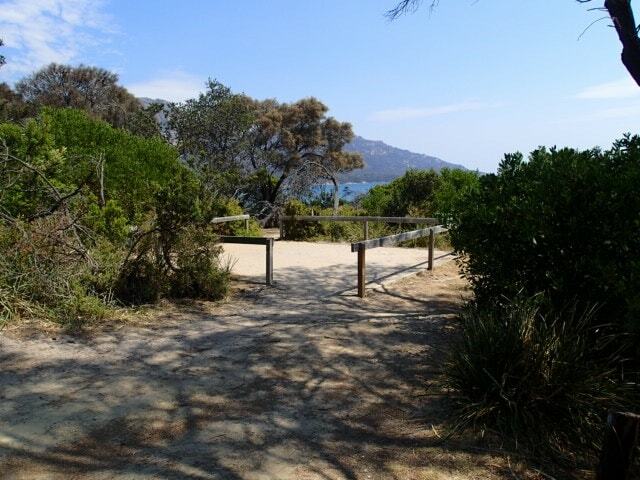 A walk to Wineglass Bay seems to be a mandatory part of visiting this park. We did it on an earlier trip, but the second trip, the weather was just too warm to do the climb unless we started early (which we didn't). Now, if you are keen to see what Wineglass Bay looks like, I have included an image not taken by us! Why? Because I can't find the photos of our first trip to Wineglass Bay to add here. Apart from that walk, there are lots of other walks of varying length you can do - whether your visit is short or long. A comprehensive list of Freycinet walks is located on the Parks & Wildlife Service site, so you can choose a walk that suits your abilities. Or if in doubt, speak with someone at the Ranger station for advice. This is a beautiful part of Tasmania and we were lucky to be there in warm weather with the sun shining. I would love to return here, but I think I would like to come in off peak time as I think National Parks are seen at their best without hordes of people. But it really is worth visiting, no matter how short your time is in Tasmania.